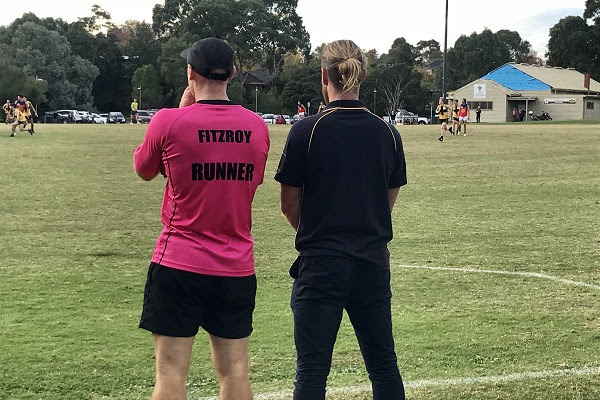 Fitzroy’s wins this season have been built on some excellent team defence, typified by a stingy backline who are keeping the opposition to an average of under 10 goals. 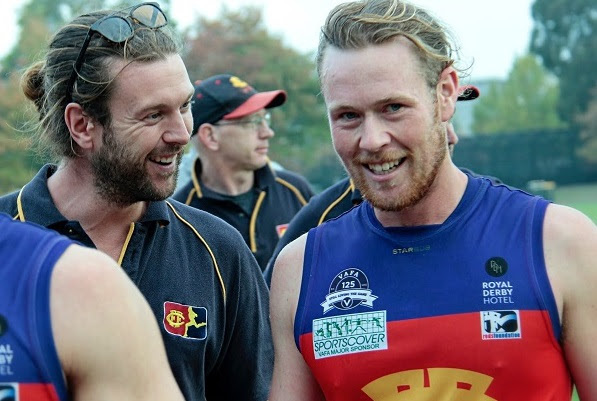 One of the men who has come back to Fitzroy after a two-year absence travelling overseas and slotted in like he never left, is Toby Hudson-Bevege and this week the beautifully balanced and ultra-competitive defender plays his 100th Fitzroy game. One of his great mates – the Bonnie to his Clyde – Rory Angiolella reflected on what makes Toby such an outstanding team mate on and off field. Here are his serious (and not so serious) comments. 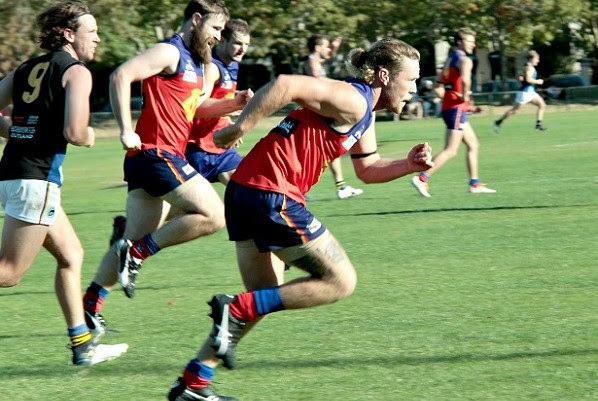 Toby plays his 100th Fitzroy game this Saturday.... when did you first start playing together? What have been the highlights of your playing days together? “Toby and I started playing together in my second year of under 19’s and I don’t think I played too many games with him that year because I played mostly seniors but I remember training with him, Dom Pound and Dylan Patcas. We really formed the start of our friendship off the field, and it’s continued to grow around football. Our friendship has had so many highlights outside of footy which is why I think we are so close now. “It’s this sort of quiet bravado that the wider community misses out on and I have great joy in exposing. After two years out of the game, have you been surprised at how well he's just picked up and fitted straight into that backline? What do you think inspired him to come back to Fitzroy? Some people describe your relationship as a bromance, how do you describe it? We agree with that final bit! Congratulations Toby and here’s to a good win to celebrate your 100 games. 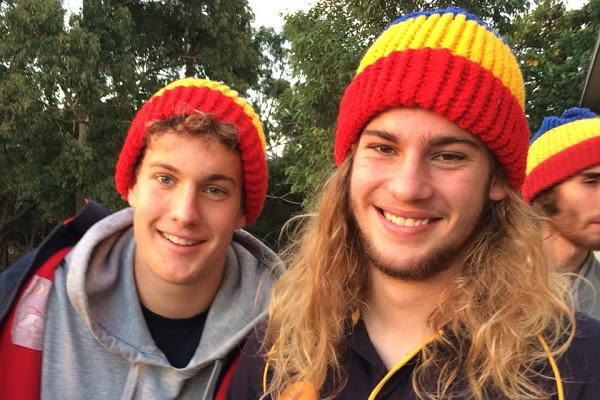 Each year the Brisbane Lions underlines its support of the Fitzroy Football Club by sponsoring a player who’s come through from the juniors. Last season they upped the ante by nominating not just a male player of potential, but a female player as well. And this year they’ve gone one better. “When our Board Chairman Andrew Wellington was lucky enough to catch the Roys’ brilliant win against Old Geelong earlier in the season, he was so impressed with Ted Clayton’s work in the centre that he actually mentioned it at the Western Bulldogs President’s function that night,” says Brisbane Lions Victorian Manager Sam Lord. When advised that Ted made up one side of a dynamic duo with twin brother Bill, the Brisbane Lions’ Chairman was only too happy to take them both on in a dual-sponsorship deal. Red Roy thinks all readers will agree that the Lions generosity has fallen on fertile ground with both boys regularly named in the best in what’s so far been a stellar run for the Roys. Coming off her three-goal haul and second best afield last week, Ruby McDermott is the female player nominated for 2018 sponsorship by the Brisbane Lions. 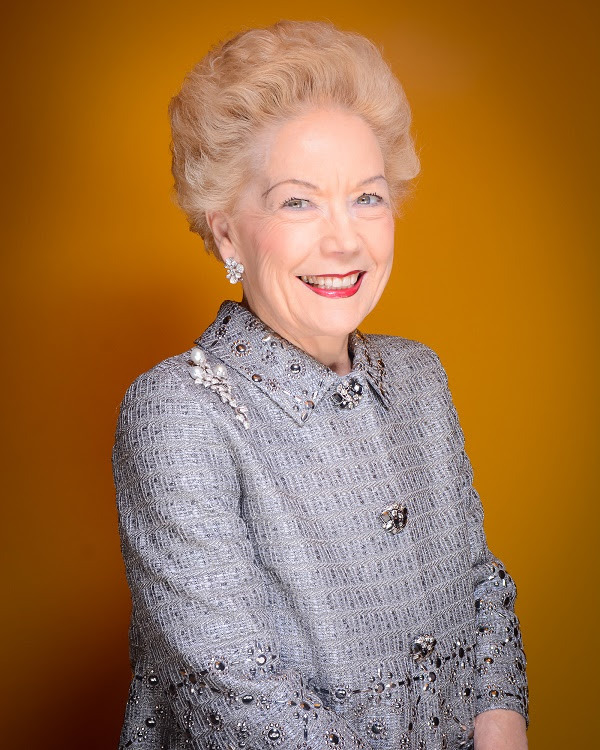 Although the Claytons support Collingwood, they have two strong links with the Lions. Their junior coach from under 13s to under 17s was Paul Broderick who played over 100 games for Fitzroy, and family friend Hugh McCluggage currently plays for Brisbane. Bill and Ted are also renowned at the Club and wider afield for achieving near-perfect ATAR scores. Indeed, they attribute some of this success to the fact that they trained and played while studying for year 12 at Northcote High School. 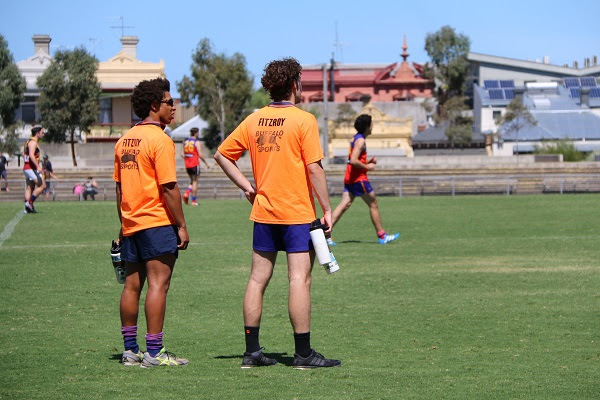 “Footy worked perfectly with school,” says Ted. “It gave me a way to forget about study without demanding too much time. The year 12/footy mix wasn’t an issue for Bill either. “The only time there was really a clash was when I had an English SAC the day after Silly Sunday,” he says. “Needless to say I took the morning off so that I was in prime condition for the afternoon SAC. For Ruby, being supported by an AFL Club only reinforces her idea that the recognition and opportunity for women will only grow. 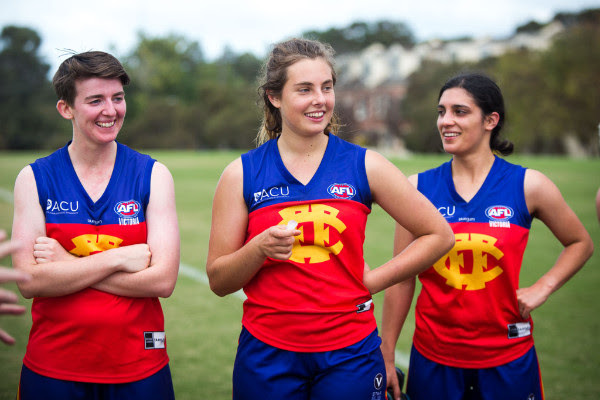 Top: Ruby McDermott (centre) with teammates from the Roy Women’s senior squad. Centre left: Ruby McDermott always finds a way to break through and score. Centre right: Ted Clayton, always cool under pressure, gets his handball out. Bottom left: Ted and Bill Clayton (front) sporting the famous Fitzroy Football Club player beanies. Bottom right: Bill Clayton shows his classic technique from the 50 metre mark. 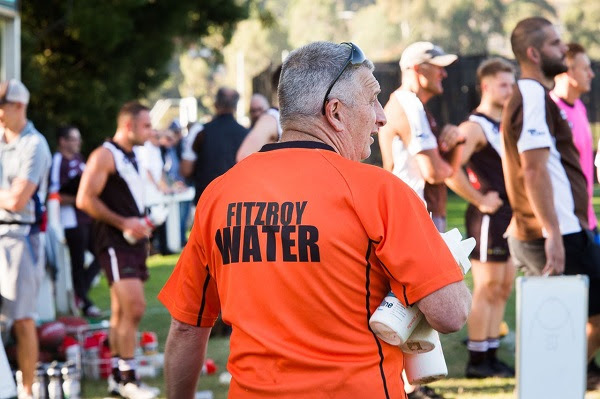 After two strong performances at home to take top spot, Fitzroy’s Senior Men’s side came crashing back down to earth with a flat performance, struggling with the tactics and the pressure of an impressive PEGS side. The home team cemented its spot in the top four of Premier C with a 10.12.72 to 7.14.56 victory over Fitzroy. 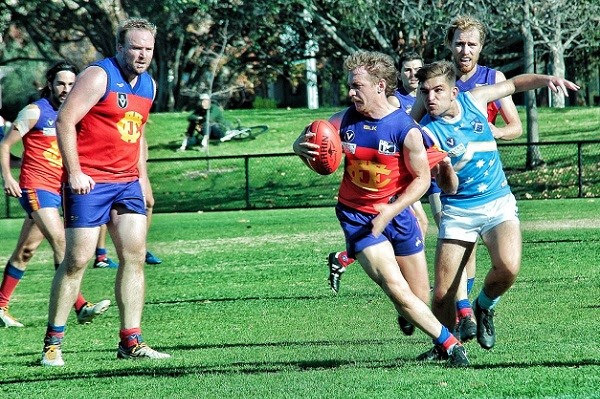 It was a day for the Maxes with Max Philpot the standout player for PEGS, whilst Max Davie and Max Ellis fought hard for Fitzroy, as did Nathan Ligris. Nino Lazzaro kicked two goals and was also named in the best players on a ground which proved tricky for goal kicking. Tomorrow’s opponent is Old Camberwell who are just outside of the four and really need the win to stay close to the leaders. Tom Biscaro and Aidan Lambert will be back in the side having recovered from injuries and Will Zahgis and Jacob Long come in for their first senior games in 2018. This is great reward for their consistently strong performances in the undefeated Reserves side. 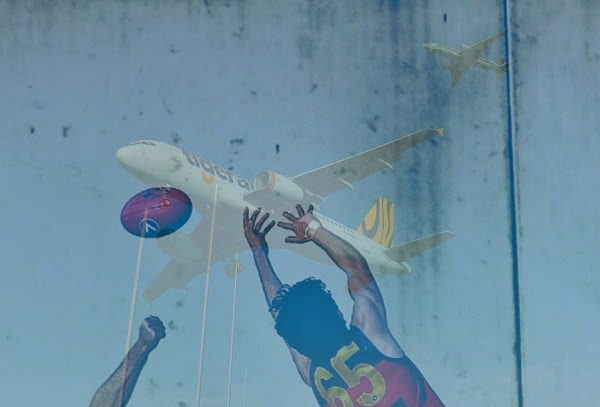 ‘Used to be, 50 years ago in 1968, a score of 7.14.56 was enough to win a Grand Final against the Bombers 8.5.53 in the now Alternative Football League. Not anymore it seems. See Nino fly up, up! Congratulations to Nino Lazzaro who plays his first senior game with the Essendon VFL side this weekend. 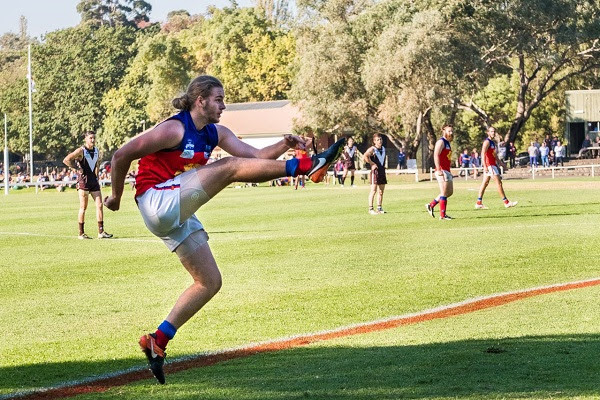 On the back of his strong form with Fitzroy he has been named to play in the Bombers’ game against Footscray tomorrow night. The Fitzroy Reserves continue quietly going about their business, maintaining top spot on the ladder with their 8th win in a row. 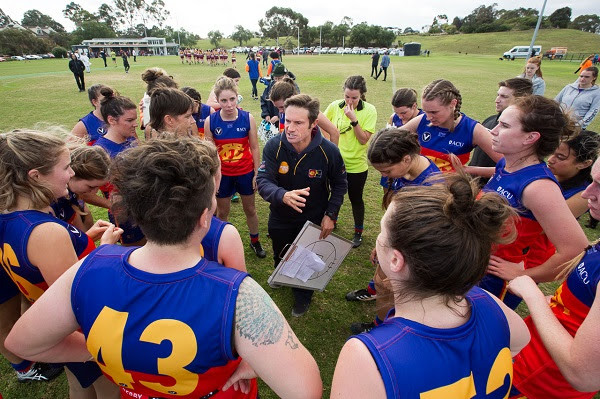 The change of start time and ground didn’t have any impact on the Fitzroy side, who perhaps benefited from the sleep in and built their win of the back of a nine goal to one first quarter against PEGS. The Seniors coach would have been eyeing off the form of Josh Robson, who kicked four goals and that of Lachie Henderson, who continued to add to his goal kicking tally with another three. Will Zaghis was again best on ground, with Drew Olarenshaw and Shae Skipper not far behind. The final margin was 18.7.115 to 5.5.35. For the trivia buffs, they currently have a percentage of 275.17 (too late, she cried!). 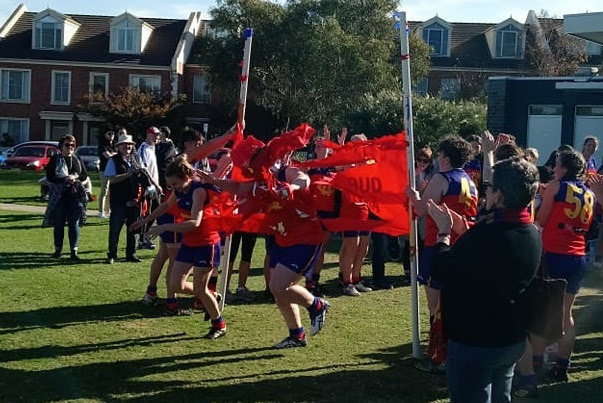 The Fitzroy Under 19 side liked its first win so much, it went for a second and got the job done against Old Melburnians. This week it was the turn of John Jorgenson to kick a bag of five and between he and Rory Patterson, they are certainly proving to be a potent forward duo particularly on a day when goal kick accuracy proved the difference. Patterson kicked two goals as did Miles Nielson, who was best on ground in the 10-point win. The two wins in a row haven’t really come out of the blue, says coach Greg Coleman. “We’ve been in all of our games for long periods but lapses have proved extremely costly, with teams spreading too easily outside the contest and piling on quick goals. We’ve just stayed positive and the improvement has come on the back of more sustained concentration and effort. “We looked at what the opposition was doing to us and turned it around. Particularly with a focus on defence. We needed to make it more difficult for them to score and we did that. “We could also see that when we had the ball we were too stagnant and kicking to congestion, which is playing into the hands of the opposition. We focused on getting out of congestion, finding space and delivering to the forwards more cleanly so they could used their talents. “Essentially we’re just doing the right things more often. “We are about to face a very testing month after the bye and that will be a really great chance to test ourselves and see if we can sustain the improvement,” Greg said. Game plans and better execution aside, apparently the new Dusty-inspired hair stylings of one Ethan Carswell is also proving a winner. 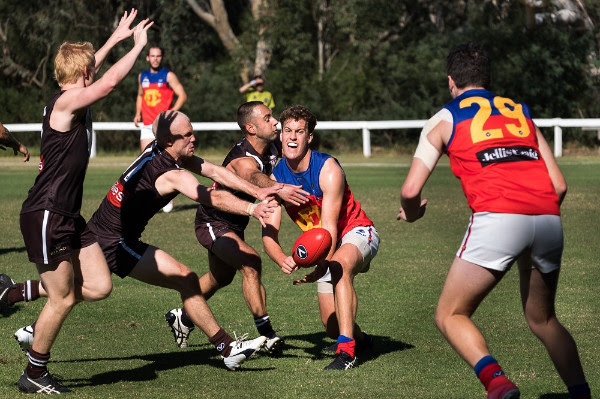 A big win over Old Xaverians highlighted some of the strong improvements the Fitzroy-ACU Reserves have been making over recent weeks in their first season in the Premier Reserve competition. The Roy Girls won 9.20.74 to two goals and now sit in the top four, aiming for three wins in a row to consolidate that spot before the bye. Coach Simon Jackson says he’s seen some big improvements in ball movement, tackling pressure, handball receives and the ability to score during the season, but knows they also need to keep improving. Tomorrow Fitzroy-ACU is up against Kew AFC, a side they defeated when they last met and the Roy Girls Reserves have the chance to be clear in the top four before coming up against a strong Caufield outfit post-bye. But Simon says they will not be taking it easy against Kew and continual improvement is the only way to go. “We will keep working on our quick ball movement and handball receives, but we also need to focus on our talking, which is a skill too. A lot of the girls are still learning how to use their voice and it can make a huge difference because talking out on the field denotes confidence. “We also need to keep improving our attack on the footy – sometimes things can be a bit timid and in self preservation mode.” Along with that comes getting better at protecting the ball carrier, Simon says. All in all, it seems his outstanding breakfast tips are just the start of what Jacko is bringing to the team. On Saturday Emily Aitkin and Sophie James kicked two goals each with Freya Shearer and Bridie Murphy named as the best players. 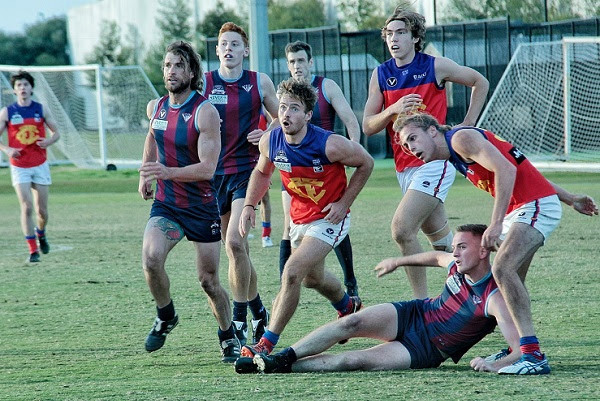 It was a case of oh so close for the Fitzroy-ACU Seniors who celebrated their 50 gamers in style but couldn’t quite hang on for a win over Old Xavs. 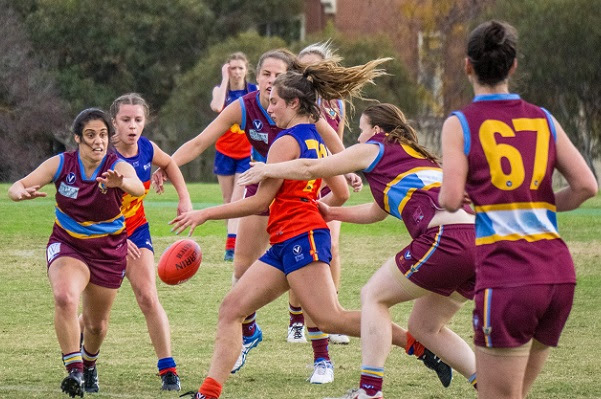 Ruby McDermott again found plenty of avenues to goal, kicking all three of Fitzroy’s goals, but with scoreless first and third quarters, Fitzroy-ACU just couldn’t find a way to win. The final margin was just two points and with a draw and a couple of close losses, the team needs to find some magic quickly to stay in touch with the competition leaders. The task doesn’t get any easier as they find themselves up against a strong Kew outfit tomorrow. The inclusion of VFL-listed players Tori Tonin (Richmond) and Lexa Madden (Essendon) tomorrow will certainly give Fitzroy-ACU a lift. 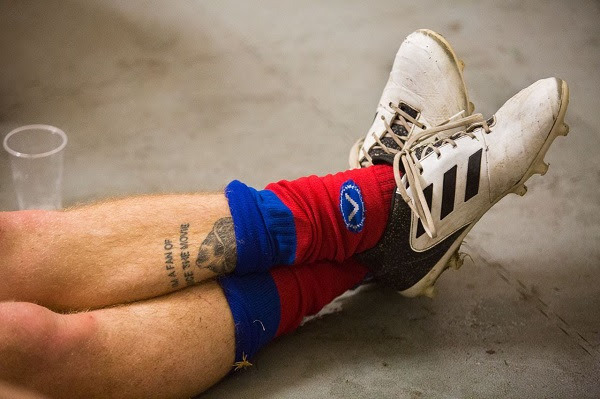 The Fitzroy Thirds were winners on and off the field last weekend. 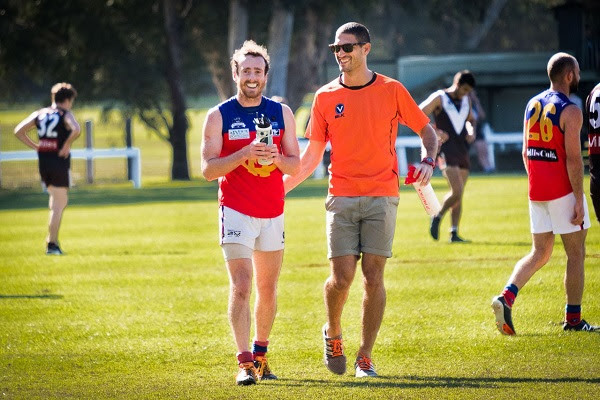 They showed no mercy in a 90-point victory over the Monash Blues at Brunswick Street Oval, on the back of some outstanding goal kicking by Chris Brown and captain Tim Denatris. That is three wins in a row for the Thirds and after a slow start to the season they are hitting their straps and keeping the pressure on Williamstown CYMS for a crack at fourth spot. In a scoreline of 20.14.134 to 6.8.44, they shared the goal kicking spoils around and in the best player department, Trent Coleman gave the nod to Keith Mckenzie, Milos Zika and Ezra Darby. After the game, the team kept the winning form going with a last-minute victory at the Fitzroy Trivia Night. This week’s game will prove a stern test as the team travels to the Paterson Street Reserve to take on second side Beaumaris. It’s fair to say when they can’t get out and play, our players like nothing better than to don the orange tops and get amongst the action. At almost the midway point of the season however, we’re running short of volunteers and putting out the call to those who’d like to stay fit in the winter and get up close and personal with our players. You need to be able to run in short bursts to reach the players and then off again as needed. 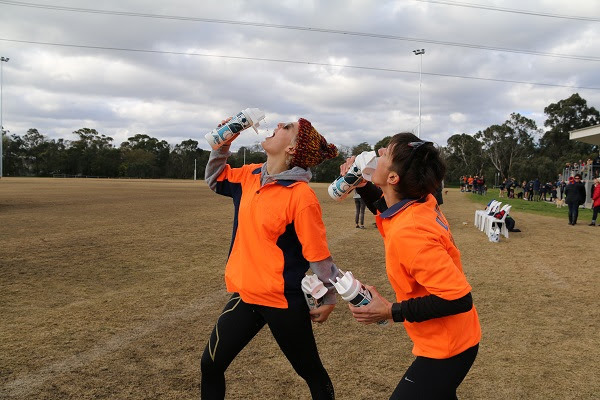 Water carriers are needed for all grades, but particularly the seniors and reserves. You need to be free on Saturday afternoons and if possible, be prepared to travel to away games also. Someone at the club can always give you a lift. If you have a passion to get involved, we have lots of opportunities; please contact Director Volunteers, Gabrielle Murphy or Director Football Ops, Sharon Torney. 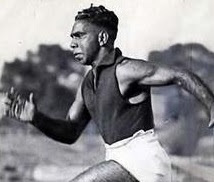 It is a wonderful thing to see the growing recognition and celebration of the Indigenous contribution to the game of football during Reconciliation Week. Over this week you’ll hear plenty of things about Sir Doug Nicholls and of course we like to remind people he played for Fitzroy. But the man was so much more than a footballer; he was a brave and incredible leader who did so much for his people.